CAPTION: The Livingston County Jail is getting a new look with the common areas of the facility being painted a bright yellow. 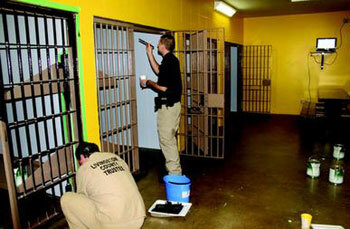 Bobby Turner, deputy and detention officer (right), works alongside a trustee as they paint one wall of the facility. In all, seven offenders (including two trustees) and some sheriff personnel are doing the work. The remaining offenders were transported to detention facilities in Caldwell and Grundy counties while the work takes place. The reason for selecting bright yellow is to enhance visibility through surveillance cameras (as shown) because the color provides a greater contrast than the previous neutral color. The Livingston County Jail is getting an interior makeover, of sorts, this week with a new coat of paint throughout. Most of the 25 offenders were moved from the jail on Monday and taken to detention facilities in Caldwell and Grundy counties in order for the work to take place. Seven offenders, including two trustees, are doing most of the work (scraping, cleaning, priming and painting) under sheriff's department supervision. They began work Tuesday morning and were expected to finish today (Wednesday) or tomorrow, according to Sheriff Steve Cox. The common areas for offenders are being painted bright yellow. The reason for selecting this color is to make it easier for detention officers to see what is happening through the surveillance cameras. The bright color provides a greater contrast to individuals than the previous neutral color, Cox said. Most of the paint was original to when the facility was built in 1978. Cox said he had been wanting to have the facility painted for a while and noted that now was a good time because the jail's population was at 25, much lower than its average of around 40-plus offenders. The offenders were moved out of the facility because of necessary work that needed to be done to the facility's heating and cooling system and as well as its electric system. Since the offenders needed to be temporarily relocated anyway because of the heating and cooling system work, the sheriff decided that now was a good time to paint the facility. Most everything in the jail is being painted, including the cell walls and doors, bed frames, tables and hallways.